Wandsworth Council has run a major consultation over the July-beginning of August period, in a cynical attempt to justify their approval for tall and massive developments in the York/Lombard Road area. The so called consultation on the Proposed Supplementary Planning Document: Lombard Road/York Road Riverside Focal Point – June 2015 presented their aim to designate the latest area available between Clapham Junction and Wandsworth town centres as suitable for tall buildings, although no consideration was given on the impact of such schemes on transport and amenities. Most of the area has already been granted or recommended approval for redevelopments of very tall and massive constructions. The cumulative impact is not considered. Public realm improvements are already ignored in granting applications. This looks like an attempt to complement all land between Clapham Junction and Wandsworth town centres and set up a blanket policy to transform the full area into a high-dense and tall buildings zone without resident consent. Overall, out of 16 sites considered in the draft SPD, only 6 sites (7 if you consider 80 Gwynne Road) are currently free of redevelopment proposals. It means than in more than 60% of the sites, current vacant sites, warehouses or 1-2 storey industrial buildings have proposals to be replaced by 17, 20, 21, 28, 30, etc storey towers. Whilst all those scheme have currently been approved or recommended in breach of the current local planning documents (buildings of 9 storeys and more are likely to be inappropriate) there cannot be any doubt on the aim to justify the existing plan to transform the Lombard/York road area into a cluster of very tall buildings (or as the developers like to put it: landmarks!). The cumulative impact of the all proposed or approved applications and the overall development of the surrounding area is a material consideration. Counting all proposals and approved schemes, we could get more that 2350 unites for the area, which might convert into more than 5000 additional residents using local amenities and transport facilities. Transport for London itself admitted, during July Crossrail 2 meeting, that Clapham Junction station was already congested and the next major improvement might be Crossrail 2 in a 15 years horizon. It was also acknowledged that the surrounding road network in the area was over-stretched. In the meantime, the Council is only planning… a pedestrian bridge across the Thames (which seems actually to be the main purpose of this SPD exercise, beside ad-hoc justification for existing schemes). Development, including changes of use, will be permitted where it does not have a negative impact on the transport system, including public transport capacity and the highway network. Development, including changes of use, will be permitted where the residual cumulative impact on the transport system, (including public transport capacity and the highway network) is not significant. It seems beyond imagination that the Council refuses to consider that an additional population of 5000 or more within the next 5 years will not have a significant impact on transport. Tall buildings: In accordance with Core Strategy Policy IS3d, tall buildings in this location are likely to be inappropriate. The skyline of new buildings on the York Road frontage should be varied and [this is a site where] a tall element could be appropriate given the desirability for a significant contribution to public space provision. The justification for a tall building in this location is that it would have the potential to allow the delivery of high quality public realm at ground level and could be positive feature in the townscape. Beside the very subjective statement of a “positive feature in the townscape”, the consideration of public realm is already side-lined in recent decisions. removing the public realm routes through the site. For areas A, B, C (town centres) the Council is considering tall building as sensitive (but not inappropriate), which means in reality, as all previous application show, that they are welcome. Battersea Reach (area D) has already been developed with high density and tall buildings. The current proposal for Winstanley and York redevelopment (area E) includes a series of very tall buildings, including several such buildings on York Garden. 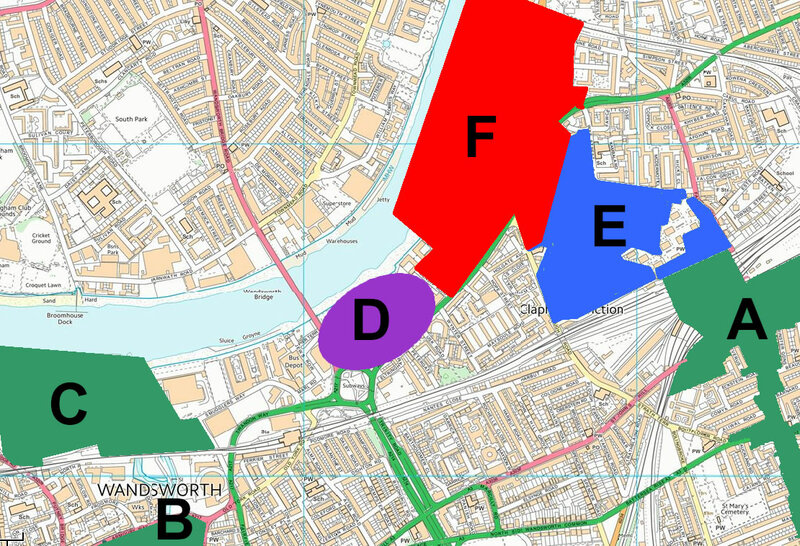 The new focal point proposal (F) looks like an attempt to complement all land between Clapham Junction Town Centre and Wandsworth town centre and set up a blanket policy to transform the full area into a high-dense and tall buildings zone. We consider this consultation as a preposterous exercise of justification for an area that has already been granted numerous developments in breach of existing policies. The arguments used in the draft consultation brochure are biased and misleading and experience shows that they will be ignored by planning decisions as “on balance benefits outweigh harm”. Therefore we are opposed to the designation of this area as a focal point as unnecessary, and this will only open doors to further steps beyond any acceptable development. You can download our full contribution HERE. As reported by attendees to the consultation meeting on Streetlife, the Council made clear that they were not considering the exercise as a consultation, but much more as a presentation of the Council’s view. First of all, in case you wonder why becoming a “focal point” involves very tall buildings, Dave Clark answered that… “it just does… it’s two years of lectures in the principles of urban development – it would take too long to explain it to you“. “We can’t – that’s never going to happen”. And finally, he also said that the Council was going to be giving the people of the Winstanley estate [through York/Winstanley redevelopment] back their “dignity”. Those living in the area will appreciate the statement. It was clearly a festival!